This is one of the city's oldest houses; its fireplace mantle bears the date of 1472. At the base of the corner corbel of the post in the north angle, on the side of rue Célestin-Philbois, a coat of arms is engraved, consisting of three fleurs-de-lis and a dolphin under a royal crown. This is the coat of arms of the Dauphin, the eldest son of the King Francis I and future King Henry II of France. It also helps to date the construction. 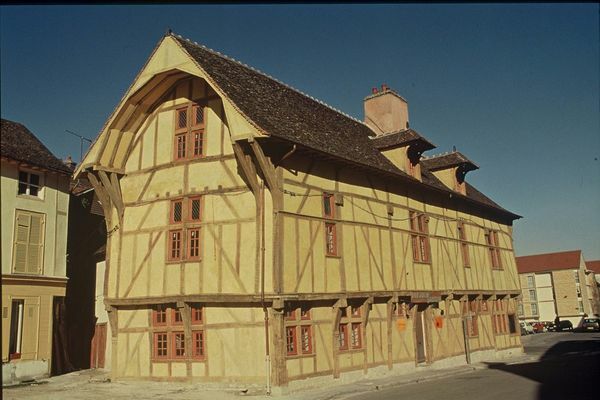 This house, with its yellow, half-timbered walls, six spans long, was restored in 2004. It is a typical example of Troyes architecture, with its mullioned windows, corbelled construction, a canopy over the rue Kléber and another over the rear façade. There is no review about Maison Du Dauphin, be the first to leave one !